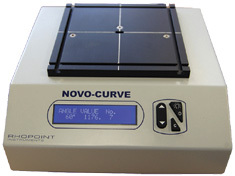 The Novo-Curve™ is a unique instrument with custom designed optics for accurately measuring the gloss of curved surfaces and small areas. It can also be used to measure flat surfaces and areas which are too small to measure with standard glossmeters. Simple checking of curved surfaces. For curved surfaces, the correct gloss value is the peak value identified on the sample. Continuous read mode on the Novo-Curve™ greatly simplifies this process. Repeatable sample positioning. 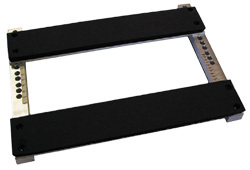 Bespoke sample securing systems allow multiple samples to be measured in exactly the same place. Detailed analysis of results. USB datga transfer of results to Novo-Soft™ for further analysis and export to CSV. Certainty of measurement. For improved gloss control, calibrate on a standard that matches closest to your sample. Additional standards are available from matt to mirror finish with UKAS/ISO 17025 certification. The detachable Cylinder Measurement Jig gives improved repeatability (as low as 0.5 GU on curved surfaces) for cylindrical objects from 5mm radius µ to 100mm.Foam baffles exclude ambient light and hold the cylinder in optimum measurement position. Can be used on any cylindrical shape, from metal or plastic pipes to small items such as pens and even confectionary. 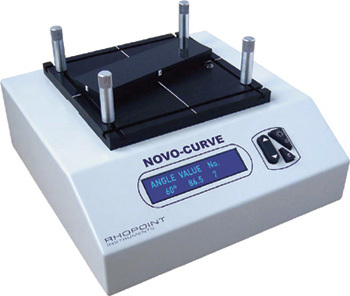 Novo-Curve with Smaller Sampling Hole makes the measurement of very small surface areas even easier. Novo-Curve is built by Rhopoint Instrumentation Ltd., and was developed in conjunction with the National Physics Laboratory (NPL), UK. A scientific paper outlining the development and testing of Novo-Curve is available on request.